Forum Index > Off-topic Talk > Newbie Spear Project -Bluing advice please? Posted: Sat 15 Aug, 2009 8:37 am Post subject: Newbie Spear Project -Bluing advice please? Hey folks, hoping someone can help me. Inspired by Sean's excellent Instant Antique Guide, I've decided I want to try some of the techniques on a low-risk/low-cost Windlass European Spear and buttcap I've just bought. My goal is to sharpen it, pit & rust it and/or blue (or brown) it, but I'm not sure in which order I should do this, plus I particularly need advice/recommendations on cold bluing. I've searched the forums of course, but haven't found any detailed conversations about cold bluing, other then the offhand mention of a few products like Perma Blue and Super Blue. Ideally, I'd like to achieve a moderately darkened patina. Can anyone recommend a good bluing paste or liquid and clue me in as to best approach? Also, a sharpening question: Should I sharpen the entire length of the "leaf" or just the leading edge? Regarding spears in general. I've been searching for images of intact, historic spears to see what, if any embellishments to the shaft may have been added. Although, understanding the nature of wood, I doubt there are many still in existence. Leather fringe around base of the spearhead? From what I can tell so far, Vikings were the only European people who really liked to add "flair." Also, if anyone cares to post pics of their own spear projects, I'd love to see them. After a long time contemplating what new weapon type I'd like to have an example of, I've concluded that: Spears are made of Awesome and Win! Posted: Sun 16 Aug, 2009 8:58 pm Post subject: Re: Newbie Spear Project -Bluing advice please? Can anyone recommend a good bluing paste or liquid and clue me in as to best approach? Also, a sharpening question: Should I sharpen the entire length of the "leaf" or just the leading edge? The bluing paste I have used is the G96 GUN BLUE CREME and I find that it is water soluble and thus can be diluted to produce a lighter blue that is more like an aged patina rather than a very deep blue/black finish. Recently I found that if I use a small piece of synthetic steel wool, usually sold as a square 8" to 10 " wide/long and about 1/4" thick I can control the degree of darkening I want by diluting the bluing paste and by applying it with a piece of soaked " fine " steel wool: The steel wool cleans the surface of the metal at the same time as the bluing paste blues the steel and I gotten a more uniform and blended finish this way than using the undiluted paste and wiping it on with a cue tip or cloth. Depending on the degree of dilution and the amount of rubbing one can get as light or dark a finish as one wants and if one removes the finish by too much rubbing it's easy to reapply bluing paste. A lot of trial and error here to get it right but one is in a way wearing away the blue and rebluing at the same time, this makes it easy to blend in the blue since a too darkl area can be lightened and a too light area re-darkened. As far as sharpening a leaf shaped spear blade I guess one would try to get the leading edge sharp and have the back of the blade gradually go from sharp to dull. Personally I would sharpen a bit past the leading edge but not down to the socket cylinder at full sharpness. I recently tried a product called Blue Wonder and it went on easily. It's not exactly a cold blue as you have to bring the metel up to about 120 degrees F. This can be done with a hair dryer on high hot or a torch if you're careful. You layer it to achieve the desired color. I did an Atrim blade and furniture, all in less than an hour. The product has a web site where you can watch a demo and order if you like. They offer it in blue or black. Although the Blue Wonder sounds like a great alternative to the full-bore boiling and dipping method, (as I understand it) and likely would produce more durable results, Jean's recommendation sounds more ...forgiving for a first-time dabbler like myself. As I discovered recently with leather dye, I have serious sloppiness issues I need to work on. Sharpen. Engine degreaser. Vinegar spray. Vinegar spray. Vinegar spray. Then some vinegar spray. Steel wool to remove all active rust. Engine degreaser. PermaBlue (sometimes you really have to rub it in and leave it on for a bit). Steel wool to get a uniform color and desired degree of bluing (anything from deep black to light gray). Sewing machine oil. 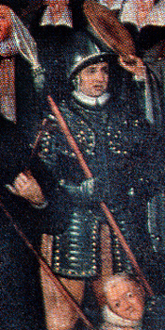 Polearm hafts, especially those of the 16th c., often had elaborate decoration. This could include domed tacks, velvet, tassels, leather strips in a spiral or lattice pattern, narrow iron strips in a spiral pattern, decorative rivet heads, filed langets, etc. (see the faux-antique example below). Decoration wasn't limited only to the finest weapons, but you'd certainly see decorated hafts among bodyguards or other elite soldiers. In general, as polearms became less useful in combat and more associated with rank (esp. the halberd and boar spear,) they became more decorative, with these kinds of haft treatments and etched blades. Tacks and a tassel look nice on a spear. I used a very simple method on one of my first projects way back when (a terrible Windlass spear head--see below). With a blued head, a crimson tassel and brass domed tacks would be fetching, especially if you antique the brass. Heh heh, thanks most kindly Sean! I was responding to your first draft post, then I looked again and saw you'd added all that excellent background info and the reference pics. Those are certainly the steps I've been wondering about. Engine degreaser and sewing machine oil never even occurred to me, so that's a bonus right there. I can certainly understand some forumites might think my embellishment approach a bit silly, I'm sure I'll feel the same in retrospect now that I'm on such a fast track to learning more. I just want to add a little bit of extra interest and hopefully character. Even if it turns out cringe-worthy, I'll post the results. If I end up serving as a warning to others, I'll still feel like I'm contributing. I now see the path before me that so many here have set out on. "Sell and upgrade, sell and upgrade!" It was terrible more in the sense of "knowledgeable, serious students of polearms tremble at the sight of it." Windlass's more recent version is much better looking. Sharpen. Engine degreaser. Vinegar spray. Vinegar spray. Vinegar spray. Then some vinegar spray. . I'm assuming this would work on any steel like a cross and pommel? What's the ratio of vinegar to water in the spray? Sorry for the minor hijack. Sean: "knowledgeable, serious students of polearms tremble at the sight of it." Ha! Don't underestimate the power of mild annoyance in a weapon, it's gotta have some kind of cumulative effect. Dying Foe: Arrgh! Your spear is.... so.... ahistorical!" Mike: "Sorry for the minor hijack." Not at all, Mike! I saw your posted topic and was gonna direct you here myself. Any non-stainless steel should work if it's truly degreased. That's essential. Try straight vinegar. Also, one of the hazards of bluing is that you have to immediately rub and oil the blued surface because it starts to mottle and rust before your eyes. I don't know what effect you'd get by applying the solution and just letting it rust. Might be dramatic.